Enjoy dressage training and trail riding in Mallorca or “Majorca,” an island located in the Mediterranean Sea off the coast of Spain. One of the Balearic Islands, it is the largest by area and second most populated island of the Spanish islands. Considered a gem with over 120 beaches, this is a popular European holiday destination and the wonderful climate makes it a great winter destination to escape to go horseback riding. There are natural, white sand beaches, olive groves, pine forests, mountains and beautiful Andalusian horses to enjoy. Mallorca has a Mediterranean climate, with mild winters and hot, bright summers. This beautiful finca or farm, located in Mallorca's Levante hills in the peaceful countryside, is dedicated to breeding and training wonderful Andalusian horses. The owner started breeding Andalusians over 28 years ago and now has about 92 horses, many of which have won awards. The riding school dates back fifteen years and is located outside of the town of Felanitx, close to Porto Colom on the coast, right in the heart of one of the major wine producing areas and an area where green capers are grown. Stay in a comfortable and rustic-style country house which has all the necessary facilities for a relaxing and soaking in the local culture on riding holidays Spain. The house is just a 20 minute car ride away from two lovely, natural beaches: Es Trenc and Cala Mondragó. Es Trenc is the most famous beach in Mallorca, as the last large beach that is relatively undeveloped. Cala Mondrago is a protected natural area with fine white sand and crystal water and dramatic cliffs. From the finca, it is just a 5 minute car drive to the town of Felanitx, where there is a traditional Sunday market that is considered one of best in Mallorca. Ride among open fields, pine forests, sandy tracks and beautiful beaches. The horses are mainly Andalusians and crosses. In Spain, many people label them a Pura Raza Española or Pure Spanish Horses. The riding style is English with multi-use saddles for the trails. Advanced riders may enjoy Dressage lessons on the finca's stallions. Andalusian horses are strong, elegant and have a good temperament. They are very well known horses in the equestrian world and prized in Spain. Here, guests gain personalized attention, so they feel very much at home. Riding instructors work to make sure travelers enjoy their lessons and get matched with a suitable horse to fir their skill level for trail riding. This riding center is affiliated with ANCCE, Asociacion Nacional de Criadores de Caballos de Pura Raza Española or The National Association of Purebred Spanish Horse Breeders in Spain. Please check out Equitreking Travel's packing list for general suggestions for what to pack for your equestrian vacation. Mainly Andalusian horses and Anglo Arab crosses. The riding style is English with trail saddles for days on the trail. The dressage lessons can be on stallions for advanced riders. Andalusian horses are strong, elegant and have a good temperament. They are very well known horses in the equestrian world. The owner started breeding Andalusian horses 28 years ago and now has about 92 horses. The riding school has been around for fifteen years and has been recognized in the media, and is well recognized as breeders of top Andalusian horses.The owners care for all their horses, cleaning their boxes daily and feeding them well. Here, guests gain personalized attention, so they feel very much at home. Riding instructors work to make sure travelers enjoy the riding times and get matched with a suitable horse for trail riding and dressage lessons to match their skill level. 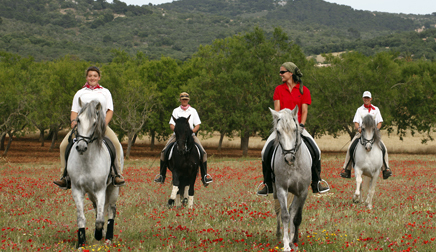 The riding centre is located outside of the town of Felanitx, close to Porto Colom on the coast, right in the heart of one of the major wine producing areas and an area where green capers are grown. Felantix is charming with a handful of traditional restaurants with authentic Mallorcan cuisine. Felantix, which was named by Queen Maria Cristina in 1886, has a fortress and castle that played an important role in the Arab resistance and the Sanctuary of San Salvador-- an impressive monument. During free time guests may head into town to take in the sights or stay at the riding center and farm and enjoy reading a book, laying on a sun bed, visiting the spa, going for a walk, drinking a coffee on the lovely terrace, or tasting a glass of wine made from the family vineyard. Small spa with Turkish bath, dry sauna, cyclone shower, vapor bath, jacuzzi, secuential shower, cold shower, hot seating bank. In the sauna there is a changing room with lockers. This beautiful farm, located in the Mallorcan Levante hills in the peaceful Mallorcan countryside, is dedicated to breeding Andalusian horses. Stay in a comfortable and rustic-style country house which has all the necessary facilities for a relaxing and soaking in the local culture. The house is just a 20 minute car ride away from two lovely, natural beaches: Es Trenc and Cala Mondragó. It is just a 5 minute car drive to the town of Felanitx, where there is a traditional Sunday market that is considered one of best in Mallorca. 8 double bedrooms, each decorated in the traditional style of the island of Mallorca. The finca has a restaurant with a big terrace, where you can see the riding center and next to the terrace there is a swimming pool area with sun beds. During the summer, dinner is served on the terrace. There are also barbecue facilities in the garden. The restaurant's experienced chef servers a variety of regional dishes, including Mediterranean food with fresh ingredients. For vegetarian guests, special vegetarian dishes can be prepared with advanced notice. Children may also enjoy special accomodations. Many food allergies may also be accommodated. Guests who are riding may choose from two starters, a main course and dessert. Water is included. Alcoholic beverages are available at an additional cost. The ideal traveler wants to improve their riding skills and enjoy dressage training on Andalusian horses and/ or explore a beautiful, Spanish island on horseback, taking in history and culture, by trail riding on the beach and in the countryside on horse riding holidays in Spain. These trips are appropriate for singles, families or groups or riders and non-riders. This week of dressage training is for riders who would like to take lessons and improve their riding skills. more experienced riders may like to ride Andalusian stallions for dressage training. Less experienced riders may be accommodated on other Andalusians and mixed breeds. This farm breeds and raises their own Pure Spanish Horses. During the week, you'll also enjoy a beach excursion. * Prices are subject to changes in currency conversions. Transfers not included. Included: Full board, acommodations, dinner on arrival day and breakfast on the day of departure. Arrive at the farm and get settled into your room. Explore the accommodations and the farm’s grounds. There is a restaurant, swimming pool, small spa, winery and lovely terraces located on the grounds. Relax by the pool, see the horses or take one of the hotel’s bikes out explore the area. The riding estate is located in the southeastern part of the island of Mallorca, near protected wildlife areas with colorful, varied landscapes. It is only four miles from the sandy beaches of Es Trenc and Cala Mondrag. Enjoy dinner in the dining-room. Enjoy riding lessons on one of the finca’s Andalusian stallions. The owner of this finca started breeding Andalusian horses 28 years ago and now has about 92 horses. The farm is affiliated with ANCCE, The National Association of Purebred Spanish Horse Breeders in Spain, and is known for its quality Andalusian horses. This stunning breed is elegant and good natured. The riding school has been around for fifteen years and has been recognized in the media, and are well recognized as Andalusian breeders. The riding schoool is located outside of the town of Felanitx, located close to Porto Colom on the coast, right in the heart of one of the major wine producing areas and an area where green capers are grown. ** The following is an illustration of the likely itinerary. However this is flexible and routes may vary due to local conditions, but always with your best interests in mind. Do you want to learn how to jump? Now you can enjoy this awesome experience for a week! Experienced teachers will teach you how to do it or how to improve your jumping technique. We’ll also enjoy an excursion to let you discover some of the most beautiful places on the island of Majorca. Enjoy riding lessons on one of the finca’s Andalusians and possibly also other breeds, depending on your riding level. The owner of this finca started breeding Andalusian horses 28 years ago and now has about 92 horses. The farm is affiliated with ANCCE, The National Association of Purebred Spanish Horse Breeders in Spain, and is known for its quality Andalusian horses. This stunning breed is elegant and good natured. The riding school has been around for fifteen years and has been recognized in the media, and are well recognized as Andalusian breeders. This Spain riding vacation is great for beginning or novice riders. Get an introduction to horses and equestrianism, learn how to ride or improve your technique. This is a six day and seven night riding vacation. You'll combine lessons with trail rides, a fun and effective way to start and enjoy riding in a unique environment! 6 hours of lessons plus 6 hours of trail riding included! The "a la carte riding vacation" offers maximum flexibility, so you can ride and also enjoy other activities during your vacation. On the first day, enjoy a one hour lesson and one hour trail ride, as well as free time to relax and explore. On the next two days, ride to Consolació and to Sant Salvador. Then explore the culture of Palma or go to the beach “Es Trenc” to swim. When you book this trip, Julie will help you decide in advance what types of lessons or trail rides to enjoy. Choose from two hour trail rides, 1’30h jumping lessons or a one-hour Dressage lesson, for the mornings. The rest of the day, use the afternoon to relax in the swimming pool area, enjoy a complimentary two hour SPA session (included in the price program) or have extra lessons or Massage at an extra cost. I went for a one week course with my daughter. Didn't quite know what to expect, but I can wholeheartedly say it was the most amazing place. The horses were very well mannered, loved attention and were a pleasure to ride. We wandered around to see horses, donkeys of varies ages and breeds–– all were friendly, even the unhandled yearlings. Steffie is an excellent teacher very patient and understanding, and took the time to explain what she was doing when working with the young stallions. All the staff were friendly and very helpful. My husband and I spent one week here in September. The rooms are basic and rustic, but quite nice (the showers in the cabins are very small so be warned! ), and I think the rooms in the actual main building are much nicer, but I was ok with the smaller cabins - we were there for the riding, not for a 5 star room. The staff are lovely and very friendly, and even with the language barrier, we got by and even had a lot of giggles trying to get our orders across. The food was really, really good, and the local wines were divine. I also got to have a few lessons with the dressage stallions and this was my favorite part of the trip. If I go again I will sign up for the dressage program, as I have a limited desire to gallop around the hills every day. A wonderful, personable guide to Spain filled with history and culture and infused with the author's wit and love for her country. Each of 12 parts of the country receives its own chapter, with ample descriptions of major attractions and history, plus plenty of advice on the joys of traveling to Spain. Highly recommended. British food journalist Richardson journeyed into Spain in search of the people and landscapes that shaped the eating habits of a nation. From interviews with top metropolitan chefs to sampling of home-made cooking in the country's interior, Richardson brings Spain's culinary culture to life. This companion to the PBS TV series, Equitrekking, proves that the world's most beautiful views are often best seen from atop a horse. This gorgeous book features dozens of scenic rides in the U.S. and around the globe. Denver Post review: For horse folk and dreamers, as well as fans of the show, it's a beautiful trip through stunning equestrian-friendly possibilities. Get off the beaten path to see some of the world's most beautiful horses and classic riding destinations with host and equestrian travel expert Darley Newman with Emmy Award-winning Equitrekking, the horseback riding travel series on PBS. Season One: Vermont, the Carolinas, Georgia Coast, Wyoming, Colorado and Spain. Season Two: Iceland, Coastal Ireland, Hawaii's Big Island, Irish Countryside, Maui, Virginia Hunt Country and California Wine Country. Season Three: Arizona, Belize, Costa Rica, Kentucky, Quebec, Texas and Utah. Season Four: Southern Spain, Alaska, Central Turkey, Quebec City and Beyond, Scotland and Wales. The Horse is an informative gallop through everything to do with the horse: evolution, history, biology, breeds, behavior, training, competition, health, and care—all gathered into an accessible gallery of solid information, essential facts, and fascinating trivia. A classic by a world-renowned teacher and master equestrian--the definitive work on the art of teaching and riding the hunter seat, now updated to include refinements in Morris's insightful program of riding instruction. Chronicling the history of the horse, this guide encompasses the early domestication of the horse, classical riding styles, as well as a survey of the great stud farms and current international sporting events. No minimum. Maximum for dressage 4. Maximum for the nature parks and monastery rides 7. English for dressage and for the trails English and trail saddles. For the natural parks and monasteries 14. For dressage 16.